Should (some) Melbourne golf courses be turned into forest? 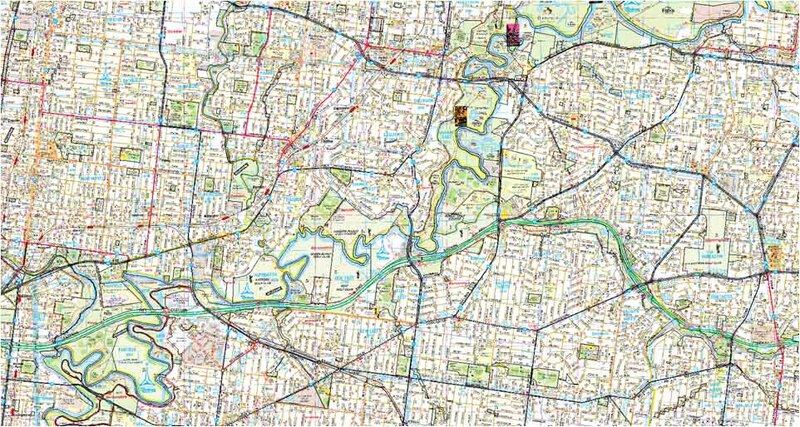 As I noted yesterday, the Yarra River park system – that ribbon of green that runs north east from the vicinity of inner suburban Kew and Abbotsford to Warrandyte State Park – is one of Melbourne’s great assets. Few other cities have such a vast expanse of relatively undeveloped land threaded through residential areas so close to the city centre. Like Melbourne’s green wedges it is used for all sorts of purposes, but rather than the sewage works, quarries and airports that sully the good name of the wedges, the Yarra River park system is mostly occupied by real “green” uses – primarily golf courses and sporting fields. At the time these facilities were established, this land was floodplain with few alternative uses. Just looking at the Melways, I can see 10 golf courses along the Yarra, of which six are clustered at the southern end of the river around Fairfield-Ivanhoe. There’s a nine hole course in Yarra Bend Park, Yarra Bend Public Golf Course at Fairfield, Latrobe Golf Course at Alphington, Green Acres Golf Club at Kew, Kew Golf Club, Ivanhoe Public Golf Course, Freeway Public Golf Course at Bulleen, Yarra Valley Country Club at Bulleen, Rosanna Golf Club and Heidelberg Golf Club at Lower Plenty. The Yarra River park system is a very special asset, but I’m not sure it’s used as well as it could be. In particular, there’s very little forest in the park. There’s a bushland area around Wilson Reserve in Ivanhoe that’s used by locals for walking, but its small and one of very few within the lower reaches of the park system. Melbourne could however have one of the largest urban forests of any city in the world. Such an asset would provide enormous environmental, recreational and tourism benefits for the city. If the three adjoining private golf courses at Alphington and Ivanhoe, say, were returned to native forest, it would produce a centrally located bushland region covering an area of around three square kilometres – more than eight times the area of the Royal Botanic Gardens. Any proposal to turn some of the existing golf courses over to urban forest would of course be immensely controversial and very difficult politically. Most of these courses have a proud tradition and loyal members. It would possibly even be impractical in the medium term if there are constraints like difficult-to-terminate leases. This would definitely be a long-term project, but one which might have an enormous payoff. It would be worthwhile examining what the benefits and costs of such an initiative might be. I think it’s highly likely the environment would be much better off if manicured grass were replaced by native shrubs and trees. It’s also possible a much larger number of Melburnites would gain from an urban forest than from a golf course, public or otherwise. That’s clearly arguable, but as the cliché goes, we should have “the conversation”. Golf is a popular game and there are around 90 golf courses in metropolitan Melbourne. But golfers do seem to require an awful lot of land. While courses have been developed in a picturesque way, they’re a far cry from the habitat and “lungs of the city” that a native forest would provide. I think it’s time for a sober analysis of what it costs the wider society to support the leisure time of golfers. While it wasn’t seen that way at the time the golf courses along the Yarra were established, there’s a better understanding today that there are alternative uses. Those alternatives would very likely provide better environmental and social outcomes. In the meantime, I’d like to see the whole park system given a unique name to tie the separate parts into one and establish it, like the green wedges, as something worth valuing and worth enhancing. It needs to be understood as a single entity. Perhaps something descriptive like Yarra River Regional Park or something more populist like The Yarra Wedge would be appropriate.